I’ve signed up to participate in the Reading USA Fiction challenge which requires reading a book from each state. I’ve set no time frame to complete it but have decided all the books will be from new (to me) authors. My pre-existing mountain of to-be-read books doesn’t actually offer a lot of assistance (woo hoo, an excuse to buy some new books) but the state of Georgia was represented by this cosy mystery I picked up last year. Set in Savannah (the state’s first capital but not the current one) the book centres around young Reagan Summerside, a recently divorced woman who has an old house she loves and on which she has performed many renovations herself. Her ex-husband’s new girlfriend (she has a name but I can’t help remembering her as Cupcake, the name by which Reagan always refers to her) is murdered in the early pages of the book and Hollis (the ex) is soon arrested for the crime. Reagan is forced to come to his aid in the form of investigating the murder herself because if she doesn’t find the killer quickly Hollis will be forced to sell the house that Reagan loves to pay his legal fees. As a premise for the debut novel in a cosy series this one isn’t too outrageously unbelievable and the plot continues in this vein, offering an enjoyable plot with the requisite number of suspects, red-herrings and odd-ball characters who ‘help’ Reagan out. Cupcake is soon discovered to have been blackmailing a number of the town’s citizen’s and between them Reagan, her Aunt Kiki the dance teacher and Walker Boone who is her ex’s lawyer work their way through the suspect pool. Unusually for a cosy there’s almost no connection to or mention of the official investigation and this seemed to work well (I always find it a struggle to believe the ‘professional with nosy girlfriends/wives’ scenario beloved of this sub genre). Savannah was not one of those cities where people didn’t get involved. In Savannah, everyone got involved in everything all the time and never let go. Savannah was more of a dog-with-a-bone kind of city. That’s definitely not like my city! 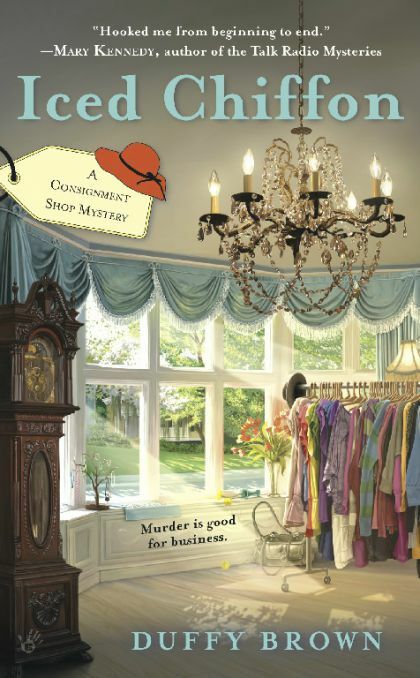 The real test of any cosy series is whether or not it can sustain its amateur sleuth premise beyond the first installment but I certainly enjoyed ICED CHIFFON enough to seek out the second book and see how Duffy Brown goes. This first taste is funny, has a great cast of characters, is evocative of its setting and the must-have gimmick (in this case it is Reagan’s burgeoning career as proprietor of a clothing consignment shop) does not overwhelm the story. This entry was posted in book review, Duffy Brown, USA and tagged Reading USA Fiction. Bookmark the permalink. I love the name and the cover – and there’s a clothes shop in it! Could be just the thing next time I feel like this type of cozy…. Bernadette – This one does sound an enjoyable read, and it’s good to hear that you felt a solid sense of place. Consignment shops can be fun settings too. And most of all it’s nice that the main character and the premise are credible. Glad you enjoyed this.